Are you a freelancer or a company that works both in Italy and abroad? Trustcom Financial will help you to better manage your company with our Business Account, a flexible and secure online business bank account. Choose the solution that best meets your needs among Basic, Standard, Premium, Extra UE and request it now from your PC or smartphone in just 5 minutes. You will not need to demonstrate your financial strength or go to the branch. The account will be available within 10 days, or, choosing the Express option, after just 24 hours! Opening the account you will receive the associated card free of charge, with a maximum daily withdrawal limit of € 5,000 per day and 150.000€ per month. Discover all its advantages in the dedicated section. We protect your business account through the use of the token, which provides for verification of operations in two steps. In addition, Bank of Lithuania guarantees the immediate availability of the entire amount present in the account, unlike Italian banks that insure only up to € 100,000. Our business bank account has been designed to facilitate all companies conducting business abroad. You can transfer money to different countries in real time with no currency exchange costs. 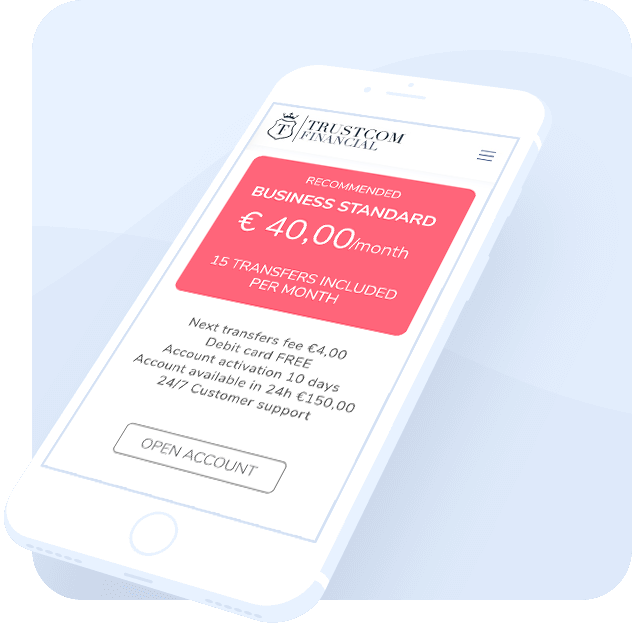 In addition, we guarantee you fast 1-day credit transfers if made in Europe without receipt fees and the highest security level with SWIFT payments. Requesting assistance can turn into a long and complex procedure. In order to provide a quality service, we guarantee the availability of our operators through online chat from 9.00 to 24.00, 7 days a week, for any type of transaction, whether linked to the card or the account, with lower response times at 3 minutes. Why a Lithuanian account for your business?